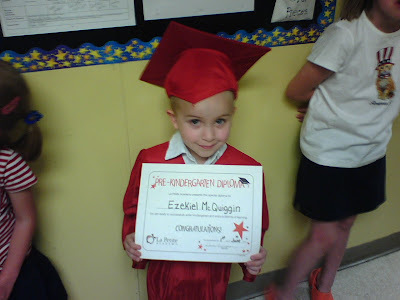 At the end of the summer, Zeke starts kindergarten. Damn, when I started this, he was still making massive messes in diapers (which I avoided mentioning, thankyouverymuch) and now we're here, with him starting school. What a long, strange trip it's been. I don't have much to say, really - finishing my parent's yard (I swear, pics in July), working loads of OT - my life is going swimmingly. As I told the binary star in my newly sweet system, I think I've swept all the karmic junk into the gutter, the past is dribbling into the sewer hole where the kids catch air on their skateboards. To KC - the birds are at the Cheyenne Mountain Zoo. To everyone else - enjoy your summer, I know I will. Peace.